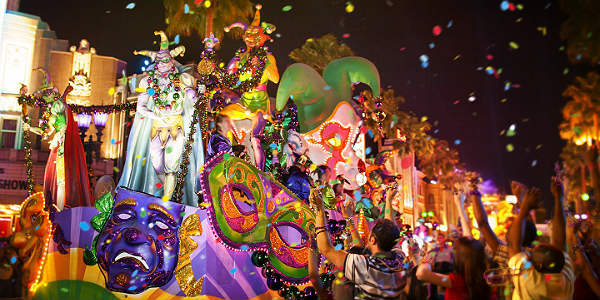 A party animal-themed Mardi Gras parade will run nightly throughout the streets of Universal Studios Florida featuring intricately detailed floats, vivacious dancers and stilt performers, and countless beads. Guests can also enjoy authentic Cajun cuisine at The French Quarter Courtyard and performances by bands pulled straight from Bourbon Street. For 13 select nights during the event, guests can even enjoy performances by some of the biggest names in music. Universal Orlando’s Mardi Gras celebration is included with admission to Universal Studios Florida or with an Annual Pass. Passholders get awesome perks during Mardi Gras like an exclusive parade viewing area, float riding opportunities and more. Universal Orlando will kick off Mardi Gras 2019 on February 9, and it will run daily through April 4 with authentic Cajun-style cuisine, an incredible nightly parade, and live concerts from some of the biggest names in music.